Circulating tumor cells (CTCs) are the main seeds that are responsible for the metastasis in the cancer patient. Primary tumor cells are the site of origin form where they shed and spread to distinct body organs through the bloodstream. In cancer patients, these prove to be the leading cause of death. Glass bead filter (GBF) is a new technique that is used to isolate,grow and re-collect CTCs. Both, biological and physical, methods are used for the collection of CTCs from the blood. CTCs expressing tumor specific antigens such as EpCAM (epithelial cell adhesion molecules), cytokeratin, etc. are collected through biological methods. On contrary to this, the physical method collects CTCs on the basis of the difference in the physical parameters (like size, shape, and texture) between blood cells and CTCs. The researchers tried to find the most convenient and simple approach for the detection and separation of CTCs from the whole blood, as the recently used approaches are quite expensive, time consuming and not appropriate to process large samples volumes. To this effect, the interdisciplinary research team comprising researchers and postgraduate students, whose majors are bioorganic, bioinorganic and supramolecular chemistry, material science, biological chemistry, mechanical engineering, and computer science, at Tokyo university of Science led by Professor Shin Aoki worked together to develop the most convenient approach of trapping, culturing, re-collecting, and analyzing the cancer cells. They used soda lime silicate glass beads for preparing the GBF and then subject it to heat treatment and oven drying. Their research work is currently published in ACS Biomaterials Science and Engineering journal. The researchers performed collection of CTCs by using glass bead filters (GBF) of 0.4 and 1.2 mm thickness and 24 mm in diameter. In addition to GBF, a small glass bead filter (iGBF) of 9.6 mm diameter is also used to filter the small volume of blood. GBF has a special porous infrastructure that helps in the collection of those specific circulating tumor cells that are bigger in size than red blood cells. The GBF method isolates the Lewis lung carcinoma cells–enhanced green fluorescent protein (LLC-EGFP cells) with 91% and 46% efficiency in saline and bovine blood, respectively. Additionally, the researchers and the team successfully trapped the circulating B16 tumor cells, from a mouse suffering B16 melanoma. The GBF method is more advantageous over other collection methods of CTCs. Significant advantage of GBF is that CTCs trapped on/in GBF (or iGBF) can be cultured and re-collected by using general biological equipment and supplies such as 6~24 well plates, centrifuge tubes (50 mL and 5 mL), etc., as well as the originally developed tools such as GBF-holder (for growth and re-collection of CTCs) and GBF-case (for the capture of CTCs in the blood circulating system). This CTC collection method by using glass filter bead is inexpensive, appropriate for the single and multiple filtrations, easier to prepare, hardly or minimally produce blood clots during CTC isolation process and can be used in multiple experiments. Difference between cancer and normal cells can easily be detected from the software program, CCF (Cancer Cell Finder), which had been developed by the same research group (Biol. Pharm. Bull., 2018, 62, 642). The cancer cells differentiate from the normal cells because of their rough surface and inner diameter. 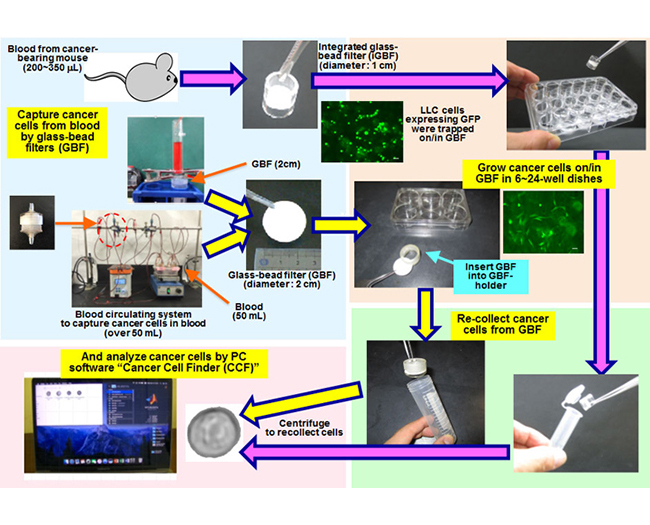 Professor Shin Aoki and his colleagues at Tokyo University of Science provided evidence that their method of using GBFs affords the simple and convenient ways for collecting and analyzing CTCs. These findings will help in the early detection of cancer in the symptomatic patients and metastatic cancer treatment, declining the mortality rate due to cancer. In future, this technique will be used as an effective tool to prevent tumor progression and metastases. Professor Shin Aoki was born in Sapporo, Japan in 1964. He graduated from the University of Tokyo with B. S. (1986), M.S. (1988), and Ph.D. (1992) degrees in pharmaceutical sciences under the supervision of Prof. Kenji Koga. He started his academic carrier as an assistant professor at the University of Tokyo from 1990. Following postdoctoral positions with Professor Chi-Huey Wong at the Department of Chemistry, the Scripps Research Institute, USA, he joined Prof. Eiichi Kimura’s research group in 1995 at the Faculty of Medicine, Hiroshima University, where he became an associate professor in 2001. In 2003, he was promoted to a professor at the Faculty of Pharmaceutical Sciences, Tokyo University of Science and has been appointed as the Vice Dean of Research Institute for Science and Engineering, Tokyo University of Science since 2018. 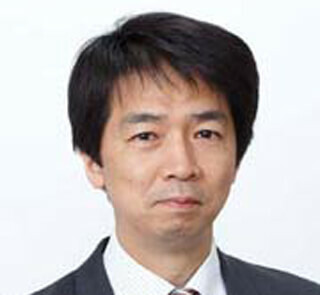 He is a recipient of the Award of Japan Society of Coordination Chemistry for Young Scientists (1999), the AJINOMOTO Award in Synthetic Organic Chemistry, Japan (2001), the Pharmaceutical Society of Japan Award for Young Scientists (2002), and so on. His major research interests are organic synthetic chemistry, bioinorganic chemistry, supramolecular chemistry, photochemistry, and medicinal chemistry, mainly using metal complexes in aqueous solution. Membership of Academic Societies: The American Chemical Society, American Society for Photobiology, The Pharmaceutical Society of Japan, The Chemical Society of Japan, The Society of Synthetic Organic Chemistry, Japan, Society of Coordination Chemistry (Japan).